Need more information about booking Home 7297421 ? 1st floor 2 bedroom apartment, including 1 double bedroom, 1 twin bedroom, bathroom with Jacuzzi bath and shower, fully fitted kitchen, dining area, lounge, balcony, free WiFi and use of large communal swimming pool. 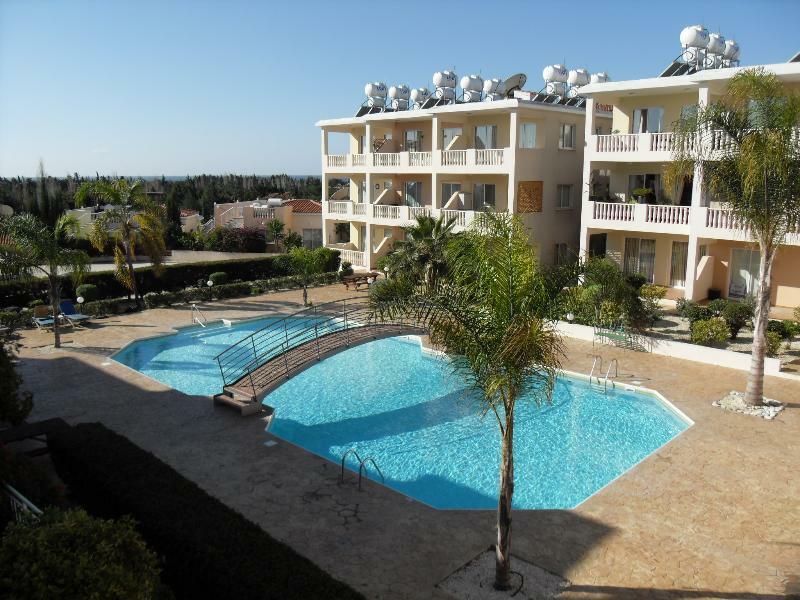 Situated near the heart of Kato Paphos, close to café, bars, shops and restaurants yet far enough to have a relaxing and quiet holiday. Bedroom 1 with Queen size bed, remote controlled air conditioned unit, built in wardrobes. Bedroom 2 with twin beds, remote controlled air conditioned unit. Built in wardrobes. You'll love this spacious bathroom especially the bath that has a Jacuzzi in it. The shower is over the bath and is nice and powerful. The WC has 2 flush setting. There is a nice big mirrow over the sink. The water is heated via solar and electrically. toaster and kettle, microwave and fridge/freezer, washing machine, iron and ironing board, pine table and 4 chairs. There are two sofas one which can be transformed into a bed. 2 Coffee tables. Free WiFi, 21" Remote Control degital TV with USB ports and separate DVD Player. Free DVDs provide for guests use along with games and books for children. Welcome folder, area information and contacts. Open-plan lounge leading onto balcony. The apartment is tilled throughout so nice and cool for those hot hot days. The apartment is cleaned before each rental. A set of towels and bed linen are provide at the start of each rental. If extra cleaning is required during your stay this can be arranged for an extra charge. The apartment is on the first floor but there is a lift for easy access. Town, Near ocean. There are bus stops near by to the town centre and the harbour. Welcome folder with important information about the apartment and the local area is provided. Free parking facilities. Lift or stairs to the apartment. There is no smoking allowed inside the apartment. It is equipped will all facilities for daily living. A case of assorted DVDs provided for guests to use and return. A €100 deposit is also required to cover damage and or any breakages that may occur - this will be refunded up to 21 days after your return and we have confirmation that no deductions are necessary. Booking fee includes: Complementary food pack (tea, coffee, sugar, bread, butter, milk, water), set of linen, and full use of apartment, outside pool and sun loungers. The apartment is in a quiet complex away from the main tourist area. It is on a regular bus route that can take you to the harbour, the town centre or the beach. The bus stop is a few minutes walk from the apartment. There is a bus timetable provided in the apartment, though it can change seasonally so it is best to double check the schedule on arrival. Car hire is by far the easiest and most convenient way to get around Paphos. If you decide to hire a car you will get the best deals online especially when you are booking your flight. There are car hire companies all around Paphos. During the high season prices can range from €20 per day for a small car. Taxi hire is readily available but not very cheap. The apartment is prepared with a complementary food pack for your arrival. You can collect the keys from the key safe outside the apartment on your arrival. You are completely independent to come and go as you like. You won't see me during your stay but if you do run into any problems during your stay, you can contact me on the details left in the apartment. There is a folder full of information about activities, places to visit, restaurants to eat at and a variety of things that you might be interested in doing during your holiday. THIS IS PREDOMINATELY A RESIDENTAL COMPLEX, THEREFORE ALL NOISE IS TO BE KEPT TO A MININMUM. NO LOUD MUSIC. NO WASHING, TOWELS ETC TO BE HUNG OVER THE BALCONY, USE AN AIRER PROVIDED. You can get in touch with Semsem (the owner) through the contact form on this page. Send Semsem (the owner) an email through the contact form on this page. Alternatively, if there’s a phone number on this page, you can call them. How do I contact Semsem (the owner)? If you’ve already booked, go to Manage your holiday booking to view Semsem the owner's contact details or send them a message. Or send Semsem (the owner) an enquiry through the Contact the owner/manager form if you’d like a quote or more info first. When you pay online through the Book your stay form, a booking request is sent to Semsem (the owner). You’ll find out within 24 hours whether they’ve accepted - no money will leave your account before then. You can also request a quote from Semsem (the owner) through the contact form. The owner will email you the total cost for your dates and a link to book and pay online. Use the Book your stay form to pay provisionally online. You can pay by credit/debit card or PayPal. Semsem (the owner) will have 24 hours to accept the booking and no money will leave your account before then. Why can't I call Semsem (the owner) before booking? You’ll need to contact Semsem (the owner) to do this. Send them a message in Manage your holiday booking or through the contact form on this page. You can request to change the dates or number of people on your booking via the Manage your holiday booking page. To change your holiday dates use the Edit booking button. If you need to change the number of guests staying then send Semsem (the owner) a message. If Semsem (the owner) agrees, they’ll send you a revised quote outlining the changes. You can review and accept/decline this from the Manage your holiday booking page. You’ll have 48 hours to take action before the revised quote expires.